PSORCARE – A Patient Care Workshop For Nurses & Pharmacists. 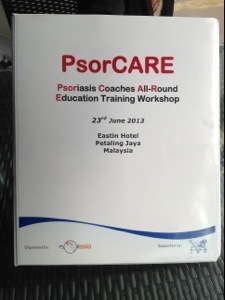 The Psoriasis Association of Malaysia had attended the PSORCARE Workshop for pharmacists and nurses which is a coaching workshop for psoriasis patient care. Nurses and patients came as far as Penang & Johor to the Eastin Hotel on 23rd June 2013. This is the 2nd workshop in South East Asia (after Singapore and next stop, Manila Philippines). The workshop is regionally by Leo Pharma and PsorAsia. We wish to applause all parties for giving up their time on Sunday to make this happen. The workshop began with Dr Najeeb Mohd Safdar the president of Persatuan Dermatoglogy Malaysia giving an introduction that included much encouragement to the participants. The association president Eugene then welcomed the participants and gave an overview of the psoriasis association including an overview about PsorAsia. 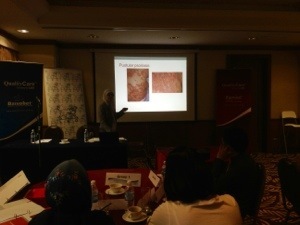 Dr Mazlin Mohd Baseri who is a lecturer and dermatologist from UKM Medical Centre gave a lively and comprehensive overview of psoriasis. The room was silent while viewing the heart breaking photos of patients with psoriasis. The treatment options that are adhered by dermatologist as part of treatment options were shared with the various participants. 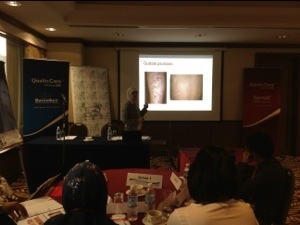 Many questions were also asked by the workshop participants about the realities that psoriasis patients face while adhering to daily treatment which included the difficulty in following their daily regimens. A session was dedicated to patient care by having patients share their stories with the workshop. Encik Samad who was an ex policeman (patient of Dr Mazlin) then shared how he has been dealing with psoriasis since being diagnosed for the past 4 years. Most of his friends had originally thought that the disease was infectious. He mentioned that he felt very stressed and angry during the onset. Encik Samad had also explained that counseling from Dr Mazlin helped him. After taking the knowledge and explaining to his family and friends, they were also more supportive. Friends were less suspicious of his psoriasis and relationships were renewed. Sister Yong Wee Hwa (senior nurse) from GHKL guided the patient conversation – so that a deeper understanding about the patient experience with the primary care professionals was better understood. Sister Yong had also shared that she came across many patients who were frustrated that there is no cure available for psoriasis. Sister Yong, had shared that in GHKL, there is a counseling support programme for patients with psoriasis which are conducted by trained nurses. This is indeed great news for all psoriasis patients. 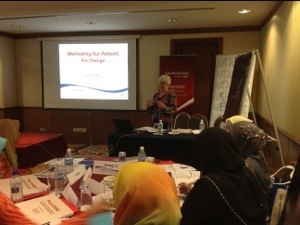 The entire day workshop continued with Barbara Page, dermatology nurse & liaison specialist from Scotland. 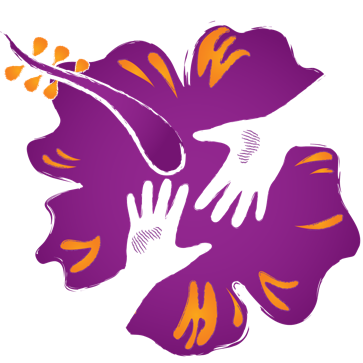 Barbara is also involved with the international skin care nursing group. In the workshop Barbara had covered topics such as “Motivating Our Patients For Change”, Case Studies (what are my treatment options, challenges in managing psoriasis, how to lead a healthy lifestyle), assessment tools and awarding of certification to participants. The workshop ended at approximately 5pm. On behalf of all psoriasis patients including those who have just been diagnosed, we thank all those involved esp the nurses and pharmacist who have given time on an entire Sunday to attend this workshop for psoriasis patient care. Our appreciation goes our to you.